Home » MiCycle » MiCycle to support Power Meter, Cadence and Speed! We are happy to announce that the support for a Power Meter and a Wheel/Crank cadence was added to MiCycle and MiCycle Pro. It is now standard in Pro version and in-app purchase option for free version. Our cycling applications are able to work with standard Bluetooth-compatible Power Meters, Speed and Cadence sensors. ANT+ sensors can also be used with the Bluetooth bridges. Power Meters typically also can provide a supplemental cadence information. Crank/pedal/bottom bracket power meters supply crank cadence. Rear hub sensors provide wheel cadence/speed data. 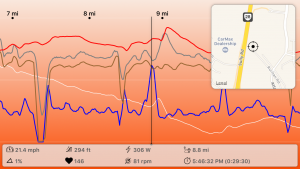 MiCycle apps are able to read cadence data as well. 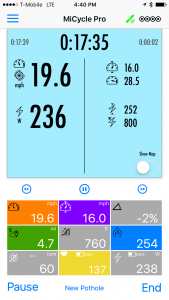 If you haven’t selected proprietary Speed/Cadence sensor – app will use supplemental data from power meter. Application supports all standard types of power meters. If you only have one-side type (e.g. left pedal or left crank) of a power meter – we provide control to double reading values, compensating for a second leg. Main display shows current, average and maximum power. You also can hear power and cadence value via voice feedback. Calculation of burn calories will be based on average power if power meter present and providing data. If not – it will fall back to good old algorithm. Speed and passed distance are now calculated based on speed sensor if it present or automatically fall back to GPS/GLONASS if not. Selected sensors are stored separately for each registered bicycle and will be switched automatically when you switch the bicycle for the ride. Besides support of Power Meter and Cadence sensors we also added Backup and Restore to iCloud option. All rides are safe now in your online storage. Main display was updated to be more effective in outdoor use and have few new items to display as well as more contrast color schema.